We do get quite obsessed with things here at HurryTheFoodup. Tempeh Salad is our new love. Our first foray into tempeh came about relatively recently – and it was a revelation. Before starting the 30 Day Vegan Challenge, we teamed up with Christine – long-time vegan and talented cook. It was she who introduced us to the joy of tempeh, and one we haven’t looked back from. Tempeh is incredibly versatile, incredibly high in protein, and incredibly tasty (when done right). We’re here to show you how to do it right. Finding enough protein as a vegetarian or vegan is not too difficult – when you’re looking in the right places. Tempeh is a great source of protein, as well as being high in manganese (an essential nutrient responsible for various processes in the body), iron and calcium. If you would like to know more about protein, please see our complete guide to vegetarian protein. 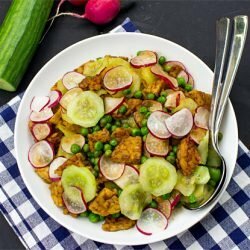 What can I expect from this tempeh salad? If you’ve never tried tempeh before, then you’re in for a treat. It has a slighty nutty flavour – but mostly it takes on the flavour of how it’s cooked. 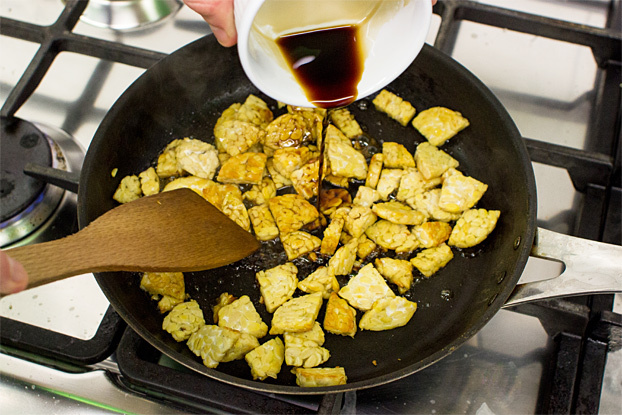 Soy sauce and maple syrup is by far and away our favourite combo for tempeh, it just fits so well. 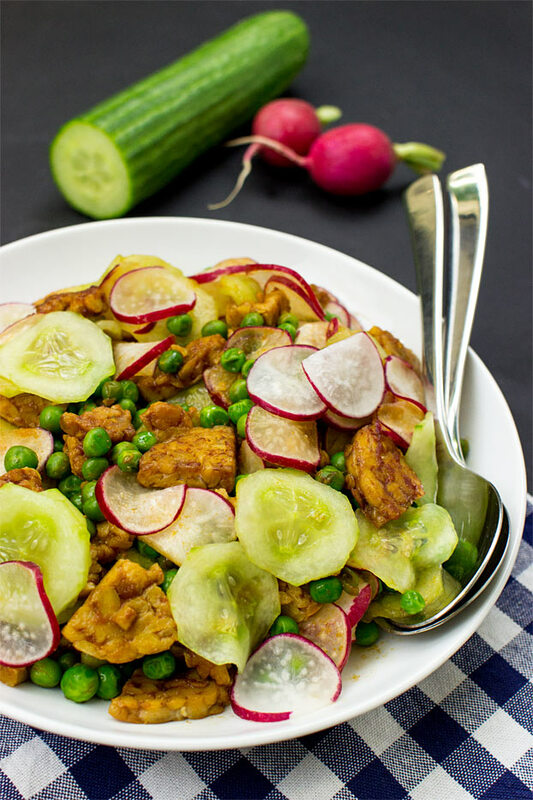 We tried many versions in our testing for this tempeh salad, as well in other recipes we’re trying out (more on those soon) and soy and syrup is just amazing. I highly recommend adding a tablespoon or two of vinegar if you like your salads with an extra tang. Of course, that’s not for everyone, but personally, I love it. 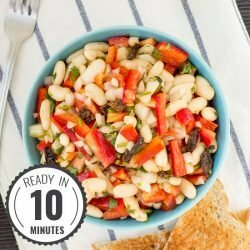 Although radish, cucumber and green beans or peas make up the bulk of this salad, I would also suggest throwing in any leftover vegetables you happen to have laying around. If you like the veg (and there’s a chance you do if you have them hanging around) then they’re pretty much guaranteed to go well in this salad. We used peas in the photos for shooting, but in all honestly I feel it’s a case of eat what you love! It’s not always easy to get our ten a day (or even possible?) but if we can find a way to sneak in a few more, then why not? On that note – if you’re in the mood for roasted veg then look no further. 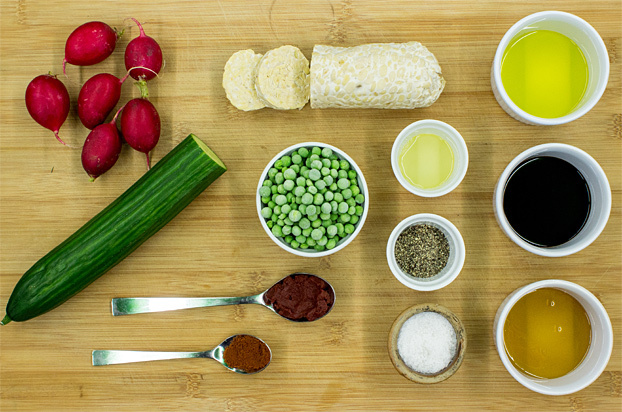 We’ve made a total guide (complete with sauces and dressings) to roasting veg. And if we may say so, it rocks. 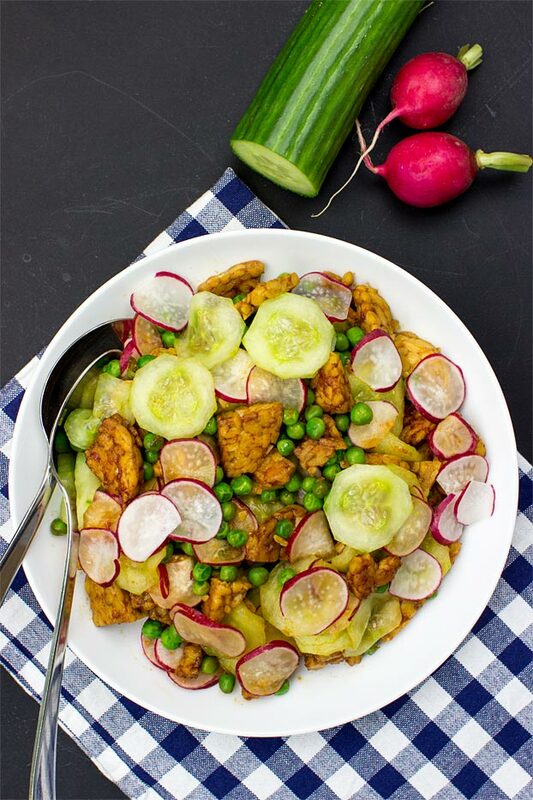 This tangy tempeh salad is just the best – quick, tasty and packed with protein. And better yet – use whatever you have in the fridge! 2 tbsp of your favourite vinegar for extra tang. Also, throw in whatever leftover vegetables you have! Peel the cucumber, thinly slice it and the radishes. Stick in a large bowl and mix in a pinch of salt. The salt will draw out excess water, which you can tip away after about ten minutes. In the meantime slice the tempeh into little pieces. Roughly chop the green beans. Fry the tempeh on medium heat for about five minutes, then add the green beans, maple syrup, soy sauce, tomato paste, paprika and sesame oil. Give it a couple of minutes more cooking, then add it all to the bowl with the radish and cucumber. 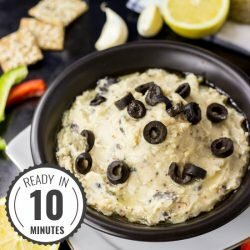 Give it a good mix, serve, and enjoy! Tempeh is tastiest when eaten right away. 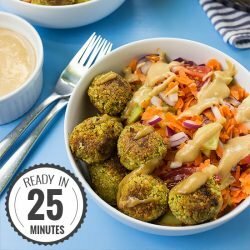 Need more vegan high-protein recipes? Head this way for a great falafel and peanut sauce dish, and over here for a delicious Asian tofu salad.